The Tanselle Collection of American Imprints brings together the output of more than fifty trade publishing houses operating between 1891 and 1930 in the United States that accepted innovative or socially progressive work, i.e. avant-garde, not welcomed by major, well-established firms. Representative authors include Sherwood Anderson, Theodore Dreiser, Edna St. Vincent Millay, Eugene O’Neill, and John Reed, as well as the first American publications of European authors such as James Joyce, D.H. Lawrence, Virginia Woolf, and E.M. Forster. The main collection consists of 7,750 items, both first editions and later printings, organized to illustrate the development of trends in printing and publishing styles. To further demonstrate changing styles in bookmaking over the years, an additional 4,000 items from other American publishers, dating from the eighteenth century through the end of the twentieth, are included in the collection, as well as 250 items that serve as examples of salesmen’s samples, and a collection of early dust jackets and slipcases. The general cataloging policies for post-1800 monographs are followed. Each printing will have a separate bibliographic record. The month of printing, when known, will be included in the date of manufacture data. If any title duplicates a copy already held at Beinecke, a comparison will be done and differences will be noted. The existing catalog record will be brought up to current standards with appropriate local notes and provenance information. This collection has been approved to shelve in secure offsite storage. 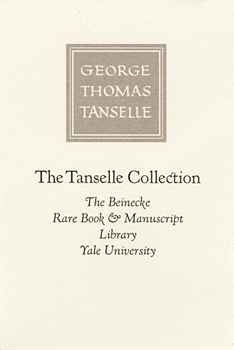 The following guidelines are used when marking volumes for the Tanselle Collection. Class as a name collection cuttered by publisher, or miscellaneous category, followed by sequential numbering. In order for the results of a call number search to display in order, each number will contain four digits, with initial zeros used as place holders (e.g. 0007). There will be individual sequential numbering sequences for each cutter, regardless of size. Serials will be classed as monographs, with serial enumeration. Items are arranged chronologically by publication date of 1st printing, then alphabetically by author's surname. Any subsequent printings of a title available at the commencement of the cataloging project will follow the 1st printing, regardless of the year of publication. All printings collected after the start of the cataloging will be added to the end of the sequence. Note: call numbers below are approximated, as these have not been cataloged yet. The books are organized into large chronological units, with some units divided into subunits. Within each unit or subunit (each with its own Cutter number), the books are arranged alphabetically by publisher; whenever a publisher is represented by more than one book, the arrangement is chronological under the publisher, then alphabetical by author within a given year (the same arrangement as that used for the in-depth collections, A35 - W45). Note the presence and location of advertising matter. If there is no evidence of ownership, no note or tracing will be made for Tanselle provenance. Blanck, Jacob. Bibliography of American Literature. New Haven: Yale University Press, 1955-1991. Wright, Lyle Henry. American fiction 1876-1900. San Marino: Huntington Library, 1966. Andes, George M. A descriptive bibliography of the Modern library, 1917-1970. Boston: Boston Book Annex, 1989. Hoffman, Frederick John. The little magazine. Princeton: Princeton University Press, 1947. Lyles, William H. Dell paperbacks, 1942 to mid-1962. Westport: Greenwood Press, 1983. Reginald, R. Cumulative paperback index, 1939-1959. Detroit: Gale Research Co., 1973. Additionally, cite author's and/or other publisher's bibiliographies when available and appropriate. Make added name entries for publishers, printers, editors, translators, illustrators, dust jacket designers, and other significant contributors. Use relator terms when applicable. Make appropriate notes and local tracings for provenance.